And, isn’t that really the essence of what a mother truly is? That very person for whom we are the MOST important person in the world. My mom had a way of making people feel that way. She truly believed in us and said as much to anyone who’d listen. Even when it was a bit unrealistic. “What do you mean she’s not going to Wimbledon?” Grandma asked, entirely incredulous. Honestly, mom was like that about everything. We often teased her about it. If you played football, she looked into getting a suite at the Super Bowl, if you painted, she framed your art, if you started a business, she tried to invest in it, if you wrote an article, she submitted it to Ellen. In her eyes, we were all the very best of everything and the most important people in the world. 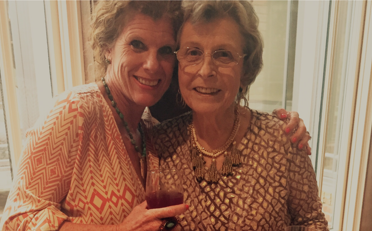 The truth is – when it came to relationships, love and believing in people- My mother was simply a FORCE. She was born in 1939 in Mobile, Alabama. Her parents divorced shortly after. She was sent to live with second-cousins in Forest County, Mississippi for reasons that were never quite clear. They were happy to take the little one in for the $12 per month the arrangement provided. However, as the story goes, my mom’s maternal grandparents, Grandma and Granddaddy Hunter would go to visit their little granddaughter every single weekend. She met our dad on the day he was kicked out of the local Catholic boys high school and sent to the public school. It was March of his Senior year. There was Doris sitting primly at her mother’s (the school secretary) desk eating her lunch. Our mom always claimed she certainly wasn’t interested in the “stereotypical bad boy” type. In fact, she was even “pinned” to a preacher’s son at the time. But dad was persistent. He kept asking her to go out and insisting each time that it “wasn’t a date” just a group of people all going to the beach or a parade or out to dinner. But these outings – they were definitely not “dates.” They were married shortly after. He would have none of it. She was perfect. She was his princess. Although mom was raised humbly and modestly by her grandparents, she stepped into the role of a military officer’s wife quite adeptly. I don’t know if she researched the role or just had a knack for it, but she entertained other officers and General’s wives like she was the original Martha Stewart. He was the most important person in the world. You could tell by the way she single-handedly held us all together during the most frightening days when my dad was deployed to Vietnam. Nothing speaks to gritty resolve like the role of a military wife and mother during wartime. I particularly remember the month of July in 1969. My mother sent me and my sister outside with a pencil and paper to sketch Colonel Armstrong walking on the moon. I realized many years later that she had simply created a diversion for us. That same week she turned 30 and let me go with her to Gayfers to buy some wrinkle cream my Aunt Rosie had recommended. I remember at the time thinking that 30 was ancient and perhaps her window had passed. But my mom was determined that her soldier wasn’t going to come home disappointed that he left behind a 29 year-old-girl and returned to find a 30 year-old-woman. She returned to the United States crossing the ocean alone with 3 young children in tow while dad was med-evac’d. She settled us into a new home and new schools, then went back to college to acquire some secretarial skills. She gave up her life as a stay-at-home mom and her dream of having another child to ensure our family security in the event our dad never fully recovered. But that decision to forgo having another child had her literally chomping at the bit a decade or so later to have some grandchildren. She trailed me and my groom around our wedding reception asking just how long we planned to make her wait to get a baby in her arms. I’ve often said, if there’s another woman out there that relished the role of being a grandmother more than my mom, I want to meet her (and then possibly arrange to be her grandchild). There simply aren’t words to express my mother’s joy and personal pride over each and every one of her grandchildren’s existence. In the earlier years, we often worried that maybe she needed to “pace herself” after the first few were born, because it was a daunting job to keep up with all the love and attention she lavished on our kids. Yet I do believe all 9 grandkids would say she managed to pull it off. She created an opportunity to speak and spend time privately with each one of them in the final few weeks before she passed away. As many of you know, the rapid progression of my mom’s disease collided headlong into her euphoria over her first great-grandchild’s conception and due date. But she never let her own despair overshadow her anticipation of this baby’s birth. In fact, she made it her personal goal to stay alive until he arrived. And she succeeded. I will for the rest of my days remain forever awed, mystified and grateful that my newborn grandson drew his very first breath the day before his Great-grandmother drew her very last. That baby was the most important person in the world. Of course I knew my mother had a million friends. Why wouldn’t she? She was colorful. She had panache. She was magnetic, charismatic, charming, a giver and a doer. I heard stories about her friends; I listened to the plans she made around them; I saw pictures of them and occasionally met them if I was in town. But nothing prepared me for the sheer number of friends coupled with the outpouring of love and devotion we received from each and every one of you during our mother’s illness. Our mother knew how to do things right… And the right way was the Doris Way. When she wasn’t bragging on us, she was dispensing advice on how to avoid our many and endless foibles. She loved to share the “Doris Way.” She would happily share her recipe for Cheeseburger Macaroni or explain a few hacks for diapering a baby. The other day I was diapering tiny baby Luke and I made a quick mental note to mention to mom later that I was “really slathering on the Desitin!” (Mom loved the word “slather.” If a product was worth using, it was worth “slathering.”) It took a split second before I realized that I would not be bragging to my mom or impressing her ever again with my generous abuse of diaper ointment. It kicked me straight in my approval seeking heart to know that she was gone forever. One of her favorite “Dorisisms” was to tell you to make yourself a note so you don’t forget. I was in charge of bringing the dress she was to be buried in to the funeral home. I did not write myself a note. It’s not like I was actually going to forget. When we arrived at the funeral home last week, I realized I had indeed remembered to bring the dress, but had left it in my car. If mom had been sitting at that table, she would’ve admonished me to get up “right this minute” and go get it NOW while it was “fresh on my mind.” But I didn’t do that. And again, I didn’t write myself a note. I’m sure by now you’ve all figured out exactly what I did – yes, I drove that dress all the way back to Oklahoma, where it could do no one any good. Mom, honestly I wish I knew what on Earth was the matter with me, but no one can say you didn’t try to raise me right. Our mother was endlessly creative, an incredible hostess, a fashion plate and a homemaker extraordinaire. She was a loyal daughter, a devoted wife, an amazing mother, a doting grandmother and a loyal friend. But most importantly, if we were listening, if we were watching, if we were making notes and taking notes, if we were paying really close attention – we realize she simply loved us. And her legacy will forever be realized if we, each and every one of us, love those that came after her – after us – making sure they know that THEY’RE the most important people in the world. I, (a tough old bird), am crying in sympathy for your loss, and in joy for your life with and memories of your Mom. Awwww thank you. It’s a very sad time for me and my siblings. What an incredible tribute!!!! Oh to be loved like that!!!! And in turn to be able to love like that, you are a very lucky lady!!! May God fill this time in your life with peace and comfort!!! How amazing that you have your first grand baby to enjoy and love!! Thank you. It was a joy to write and present. Very cathartic. The best parent eulogy I’ve ever heard! You were blessed to have such a lovely mother! Thank you so much. Trying to focus on the blessings. Truth in every word, Sis. Love the fact that God gave you the gift of writing… That way all that follow her in life know exactly what it means to be a Mother, Wife, & Friend. Beautifully written. I have tears rolling down my face. Well done. Thank you so much. I loved writing this and giving it st my moms funeral. Leslie – I am so sorry for your loss. What a loving tribute you wrote to your Mom! You are all in my prayers. As long as I get a footnote!, lol! Even all these years and miles away, I can hear your voice and see your tears in this beautiful eulogy to your mama! She is nodding and smiling (and yep, probably shaking her head, as well!) from heaven, and I KNOW she is proudly regaling God and the angels with your stories! Stay strong, you will feel her with you at all the right times. Our sincerest sympathies, my dear friend. Thank you so much. I think you’re right! Thank you. She was lovely and I miss her already. You did a great job delivering this eulogy at the service. Thank you Dian. It was good to finally meet you. Thank you. We were blessed and you are too! I can only imagine what the world would be like if every single person was worthy of such a eulogy. Your Mom would be so proud. Thankyou for sharing your beautiful words with us. Sympathies from across the world away. I love the way you write. Nell- I can’t even tell you how your kind words up,ifted me today. Thank you so much!! !